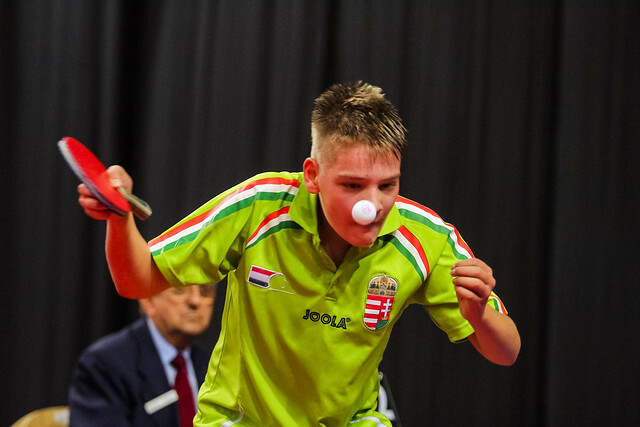 The host nation’s Patrik Juhasz and Switzerland’s Lars Porch, the top two names on duty in the Junior Boys’ Singles event at the 2017 Hungarian Junior and Cadet Open in Szombathely duly finished in first places in their respective groups on Wednesday 9th November. Likewise the next three names in the order of merit, Moldova’s Vladislav Uru, surprise qualifier at the recent Buenos Aires 2018 Youth Olympic Games European Qualification Tournament, topped his group, as did Portugal’s Tiago Li and Romania’s Dragos Florin Oprea. However, in a competition where the top 32 ranked players were not required to compete in the initial group stage, there were surprises as players sought a top two finish in order to secure a main draw place. The players in particular to catch the eye were Spain’s Marc Guttierez and the Czech Republic’s Tomas Kordas. Marc Guttierrez remained unbeaten. Notably, he accounted beat Germany’s Felix Wetzel (11-6, 11-9, 14-12) the highest rated player in the group; it was the only defeat Felix Wetzel was to suffer, second place was his lot and thus progress to the main draw. However, life was somewhat different for Tomas Koldas. He lost to Chinese Taipei’s Lin Hsin-Yu, the top name in the group (9-11, 12-10, 11-6, 5-11, 11-8) but accounted for Slovenia’s Aljaz Frelih in three straight games (11-6, 12-10, 11-1). Somewhat surprisingly in the opening match in the group, Lin Hsin-Yu had suffered a five games defeat at the hands of Aljaz Frelih (11-9, 4-11, 11-6, 9-11, 11-9). Thus games ratio decided the outcome; first place finished in the hands of Tomas Kordas (5:3), it was second place for Li Hsin-Yu (5:5) with Aljaz Frelih in third spot (3:5). Meanwhile, in the Junior Boys’ Doubles event, as matters progressed to the quarter-finals, there was just one upset. In the fourth round the combination of Austria’s Maciej Kolodziejczyk and Moldova’s Vladimir Ursu beat the French combination of Lilian Bardet and Jules Rolland, the no.3 seeds (10-12, 11-9, 11-6, 12-10). Defeat for the third seeds but no such problems for the top two pairings; also from France Irvin Bertrand and Leo de Nodrest advanced to the round of the last eight, as did Belgium’s Florian Cnudde and Valentin Pieraert.